I have been guilty of idolizing certain people. Because of my many life experiences and my high comfort level in dealing with other human beings and multiple personalities, I have a pretty strong sense of perception. Many times, I sense qualities in people before they even demonstrate them straight out to me- so it’s easy for me to engross myself in severely liking a person before they even earn it. The problem is that when a person is placed in a position where they don’t have to”earn” your love and loyalty, they can take your person for granted rather easily, and the “bubble of illusion” that you created inevitably pops- and it pops LOUDLY. It is essential in the beginning of any type of relationship- work/friendship/love – that you take your time in allowing the other to “earn” your person. By this I mean to make sure to allow sufficient quality time to pass before you skip to the conclusion that this is someone you want in your corner. Be vigilant. No relationship that starts with lack of quality time and work put in equally by both parties will stand the test of time. All relationships are based on compromise and a healthy dose of generosity on both parts- and if one of you keeps making excuses for the other because in your heart you just “know” they mean well, you are only hurting yourself. I have recently committed to a new strategy of weeding out whether or not I want to expend energy on a person, and it has worked well not only in decyphering between new people that I meet, but it has also highlighted the inequalities in my current relationships with others, and has led me to cut them off in a very necessary way to balance out the field. I simply don’t need anyone in my life who isn’t as generous towards me the way that I am towards them. The strategy involves writing down the qualities that make a person either generous or selfish. I take a piece of paper and divide it with the categories “GENEROUS” and “SELFISH”. Underneath each, I write the appropriate examples when the person has reacted a certain way that fits under each category. When you force yourself to write these down, it makes it more difficult to dismiss or overlook the issues that you might overlook should you only be thinking about it. When you see things in black and white it makes things a lot more clear. No excuses. If at any moment the “Selfish” category starts to dominate, it’s time to cut your involvement. 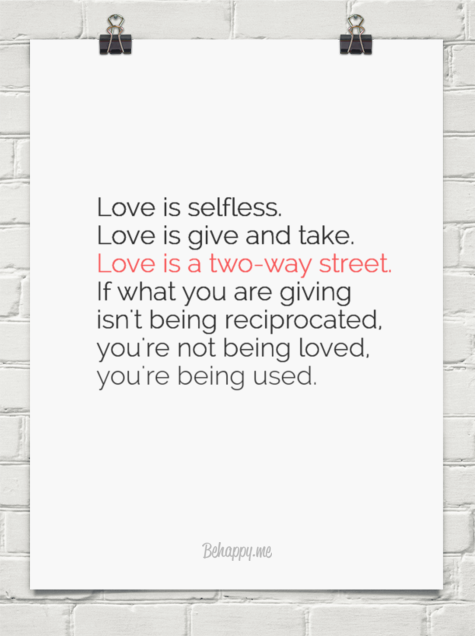 Even if it’s even with the “Generous” category- you should still proceed with caution. Try not to be fooled by those people that have the gift of gab- just because they can talk their way through something does not mean they are being honest. Usually grabbers are entertainers, and they know how to mimic the desires of the person they are dealing with versus engaging them with honest conversation about their own expectations. Make the people in your life accountable. Allow yourself then the freedom to know that you are surrounded only with those that truly have your best interest at heart, as you do theirs. This enables you to become truly productive and happy in your environment. Everything else is just plain unecessary.